Since early 1994 the PDA Developers Group at TecO has been investigating Personal Digital Assistants (PDA) with respect to their integration and usability in distributed systems. The main platform for our research and development has been the Apple Newton MessagePad. Before Xmas 1994, we presented the first Web browser for Apple Newton, in fact the first web browser for a palmtop device. The browser won a best paper award at the WWW2 Conference in Chicago, October 1994. The version 2.4 fully supports the Newton Internet Enabler (NIE) and so it is possible to connect to almost every Internet Service Provider (ISP). PocketWeb is available for the community under the terms of the PocketWeb License Agreement. For private usage you only have to send a funny postcard to the TecO (PostCardWare). Since version 2.4 PocketWeb is able to decode and display GIF images. To use other image types it is possible to connect to our special PDA proxy (pda-proxy.teco.edu). (Because of some changeovers, the Proxy may be some times not reachable - please be patient). This proxy is able to adapt HTML pages and images for for an optimal output on PDAs. Due to the very limited resources on a PDA, PocketWeb uses an special management layer and cache architecture. For example, the latest version of PocketWeb only uses one fourth of the memory to cache a HTML page than used by the a standard webbrowser. 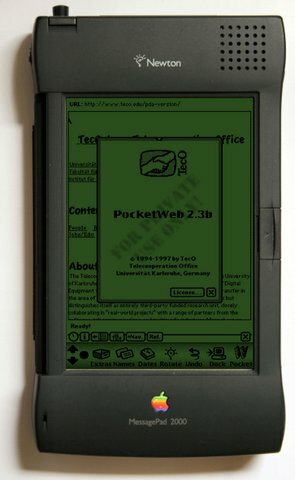 PocketWeb 2.4 runs with Newton OS 2.0/2.1 on a MP120, MP130 or MP2000. It also should run with a MP2100, but we weren't able to test it (Please send us a short email about your experience of PocketWeb with a MP2100). (PocketWeb 1.9, the last now unsupported version for Newton OS 1.3, is still available). Please have a glance to the following documents before downloading: FAQ, files.txt, readme.txt, install.txt. For further information contact the PDA Developer Group. Q1: What is the current version? Q2: Can I use PocketWeb behind a firewall? Q3: Which picture formats are supported? The PDA-proxy is still under development and NOT available to the public. If you have problems connecting to our proxy (current address: pd-proxy.teco.edu:8080 ) please send us an email. Yes, since version 2.1 we connect to the network using NIE 1.0 or above. Q6: Do I have to use the PDA-proxy? No, you can work without using the PDA-proxy.